The Tsimhoni Case soared into international headlines after Judge Gorcyca in Oakland County, Michigan ordered the three Tsimhoni children, Liam 14, Roee 10, and Natalie 9, to juvenile detention for defying her order demanding that they speak with their father who they claim is abusive. Since then, she has forced the children to undergo controversial reunification therapy and has placed them in their father's sole physical custody without an evidentiary hearing. The attorneys for the mother, Maya Tsimhoni, filed a motion to disqualify Judge Gorcyca on the basis of apparent bias against the mother, but Gorcyca denied that motion as of October 5th. Additional hearings before Gorcyca's court are scheduled for October 6th-9th. The allegations of Gorcyca's bias are supported by her statements made at the June 23rd hearing, during which she threatened the mother, "If the show cause goes forward, you are going to be strip searched. You are going to take off your clothes and be strip searched and squat." Furthermore, she has accused the mother of being "the problem" and has implied her guilt repeatedly in spite of evidence suggesting that the children are afraid of their father because of his actions. Gorcyca's behavior in court has been publicly criticized with Crime Feed naming her one of "5 Corrupt Judges." During the hearing when Judge Gorcyca sentenced the children to juvenile detention, she violated all five of their basic rights of agency, equality, dignity, protection, and privacy as explained in an article appearing in Psychology Today. Gorcyca even threatened to violate their most basic privacy rights to use the bathroom unobserved, saying to the youngest child, "Let's see, you're going to be a teenager. Do you like going to the bathroom in front of people?" Still Judge Gorcyca remains on this case, although media attention has declined due to a gag order she issued under the guise of protecting the children's right to privacy. The media is not allowed to interview the people involved in the case and cannot release certain information about the case. The father's attorney Keri Middleditch even made an attempt to subpoena Twitter to release the personal information of activist Shawna Shakespeare who runs the Twitter account @JusticeTsimhoni. The subpoena was justified by an unsubstantiated suspicion that @JusticeTsimhoni had illegally obtained a CPS report from a sealed document. The allegations were false, as the CPS report was from another document obtained legally through the court house. In an article from The Observer, Ms. Shakespeare is quoted as saying, "[Gorcyca] has no jurisdiction. It's just a scare tactic. To silence people. But I refuse to be silenced. I refuse to give up." The efforts to silence activists, gag media, and seal documents beg the question: "Who is the court trying to protect?" One could choose to believe that these measures were actually intended to protect the children's privacy, but the public has no assurances that Judge Gorcyca cares to protect the children's rights. If the children's "privacy" from the media is more important to Judge Gorcyca than their privacy in the bathroom, perhaps that is an indication that the public should keep an even closer eye on this case. As it is, the children and their mother are at the mercy of the judge who has egregiously bullied them in court. The gag order ensures their silence and guarantees that the only opinion allowed in the media is that of the court. Unless we trust that the court is protecting the best interests of the children, that needs to change. 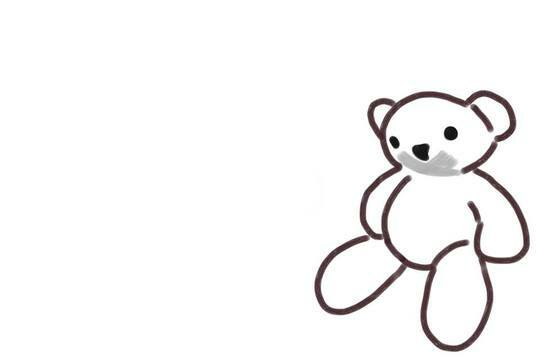 A protective mother made this meme showing Mr. Bean's Teddy: the comfort object that her son cherished when they lived in a domestic violence shelter. She writes: "Teddy symbolizes every protective parent and child who isn't allowed to speak up because people refuse to listen. Our silence becomes an elephant in the room full of sadness."